Constructed of durable, virtually maintenance-free Kydex®, the Triton is fast, thin and easy to conceal. 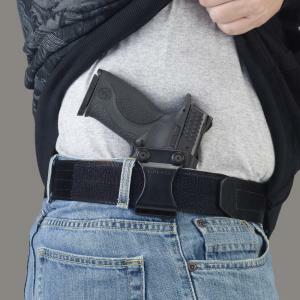 The belt clip offers quick on and off capability, while the sweat guard protects both gun and gun carrier. The firm holster body allows a smooth and easy return to the holster after the draw, while the raised sweat guard protects the pistol from corrosive perspiration and also protects your skin from hard steel! Constructed of Kydex, the Triton is available in black and fits belts up to 13/4. WARNING: The Triton does not function with M&P pistols with manual thumb safeties.